‘The Joy of Pen and Ink’ workshop was a great success everyone went home with some great pictures and a better understanding of using colour wash with pen and ink. March has bought with it a rainbow of spring flowers and blossoms so we have made the most of it. Our ‘5 Week Beginners’ workshop was a great hit as were our ‘Spring Basket’ and ‘Mini Daffodil’ workshops. In line with our bid to promote environmentally friendly floristry our ‘Foam Free Floristry’ workshop was a real eye opener. 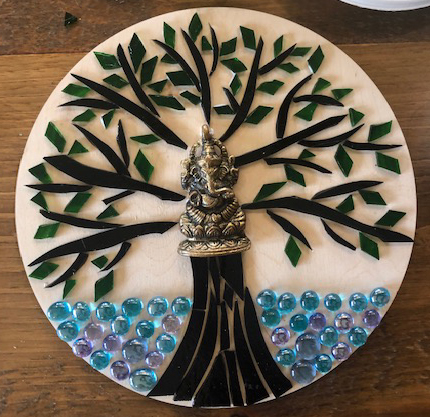 Here are just a few pictures from March’s workshops………..
We were busy hear at ’The Lodge’ this February with lots of workshops including our ‘Willow Sculptures’ and ‘Patchwork of The Crosses weekend. Just a quick note to say how very much we enjoyed our course last weekend. We came away feeling refreshed, inspired and conscious of having had a magical weekend. January can be a bit hit ‘n’ miss in the garden, the weather is very changeable and a little chilly so when the sun pops its head out we take full advantage this week a bit more digging and the continual weed battle. We try to compost as much garden waste as possible and some we burn in our fire pit. 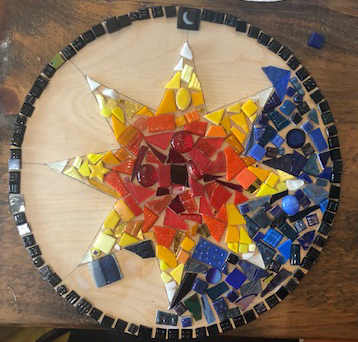 Mosaics date back as far as the third millennium BC, popular in ancient Greece and Rome they were widely used to decorate religious buildings often depicting religious stories. They fell out of favour during the renaissance, but in recent years have enjoyed a huge rise in popularity. 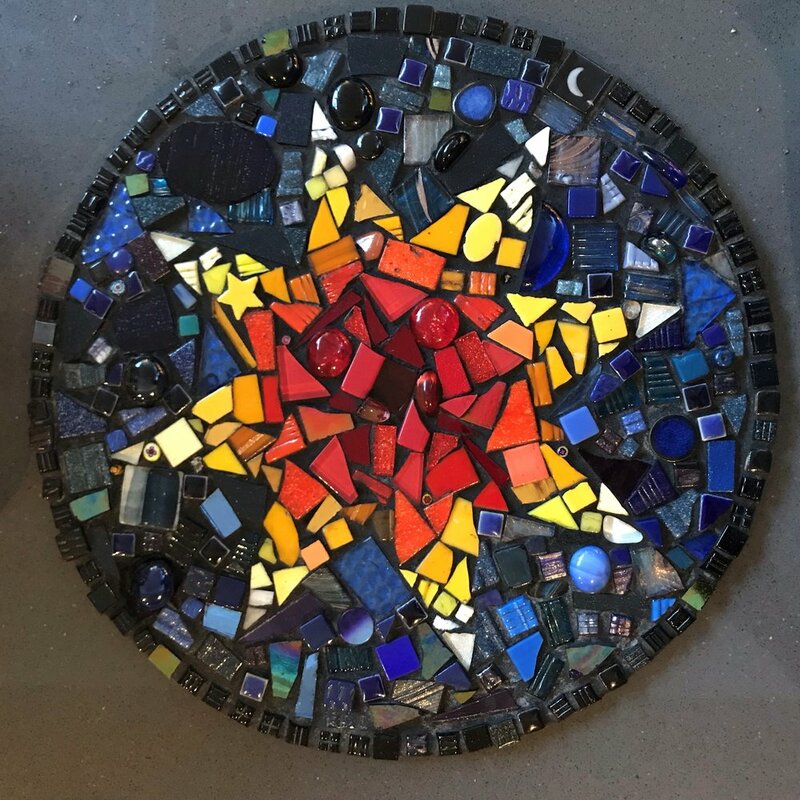 Modern mosaics are created by artisans and crafters such as Debra Stuart who will be sharing her skills with us in March and April with two exciting Mosaic workshops. 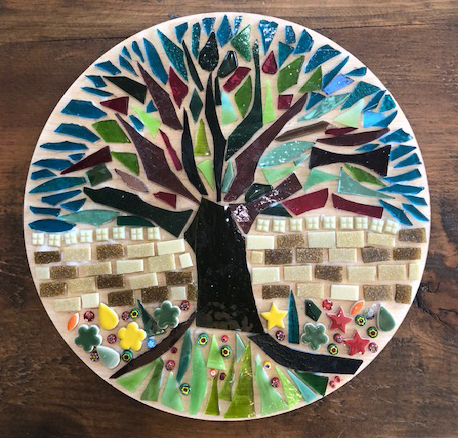 Using a variety of materials tiles, glass, pebbles, old jewellery and ceramics she will show you how to create either a tree of life mosaic or a garden mirror a great addition to any home and a skill you can use to create just about any decorative mosaic. 1. Melt 1 tbsp. coconut oil in a saucepan over a medium heat and soften 1 chopped onion for 5 mins. Add 2 grated garlic cloves and a grated thumb-sized piece of ginger, and cook for 1 min until fragrant. 2. Stir in 3 tbsp. Thai red curry paste, 1 tbsp. smooth peanut butter and 500g sweet potato, peeled and cut into chunks, then add 400ml coconut milk and 200ml water. 3. Bring to the boil, turn down the heat and simmer, uncovered, for 25-30 mins or until the sweet potato is soft. 4. Stir through 200g spinach and the juice of 1 lime, and season well. Serve with cooked rice, and if you want some crunch, sprinkle over a few dry roasted peanuts. I always like the start of the new year - it’s a time for reflection and a time when we tend to look inside ourselves and think about what we are going to achieve in the coming months. If, like me, you derive pleasure from buying a new diary and notepads galore – recycled, of course – it’s the perfect time to spread out your new stationary and start planning. This year our plans include getting the cutting-garden up and running and continuing to make the flower and craft school as environmentally friendly as possible. For some time now I have been moving away from the toxic green foam that so many florists use and will be using more sustainable floristry techniques - with this in mind we have launched our first ‘no foam’ floristry workshop – SPRING, THE NATURAL WAY to share and encourage all you flower lovers to follow the same path. Don’t forget to sign-up for our email updates to see details of all new workshops. What a fantastic festive season we have had so far, so much laughter, singing and floristry fun. 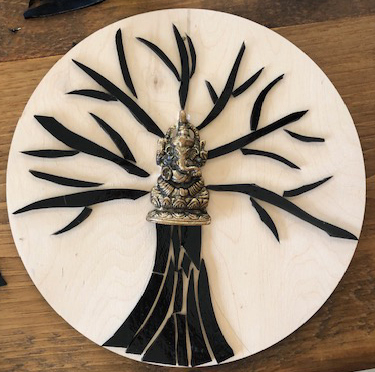 Our workshops have been a great place for friends and family to meet and create some wonderful memories, wreaths, trees and arrangements. Add the cranberry, red grape and orange juice to the pan, push the cloves into one orange and slice the other add along with the lemon rind to the pan. Put the cinnamon and cardamom pods, grated nutmeg and sugar into the pan and heat gently until almost boiling. Turn down the heat to the lowest possible and simmer for 30 minutes to infuse. I’ve heard this rhyme so many times and never given the rhyming words much thought, who knew a tuffet was a real thing? Well, not me . . . . I knew Little Miss Muffet was sitting on a stool but hadn’t made the connection it was called a tuffet. So when our sewing tutor Paula Smith showed me her latest tuffet creation everything fell into place. According to Wikipedia ‘A tuffet is piece of furniture used as a footstool or low seat, distinguished from a stool in that it is completely covered in cloth so that no legs are visible, and is essentially a large hard cushion that may have an internal wooden frame to give it more rigidity, wooden feet may be added to the base to give it stability’ . . . . fascinating. I love flowers their natural beauty can be quite breathtaking, so when someone mentioned paper flowers to me I was a little skeptical but when I saw the flowers that Botanical artist Bee Watson made I was sold. Great day yesterday with Kate from ‘Payhembury Marbled Papers’ and Edel form ‘Edels handmade books’ such a lovely group of ladies and some really amazing results…….